CJ next to his display case – they make everything. Finally, those with a sweet tooth can find relief on Voltaire Street in OB. CJ’s Catering has opened its doors after months of anticipation by locals and fans. 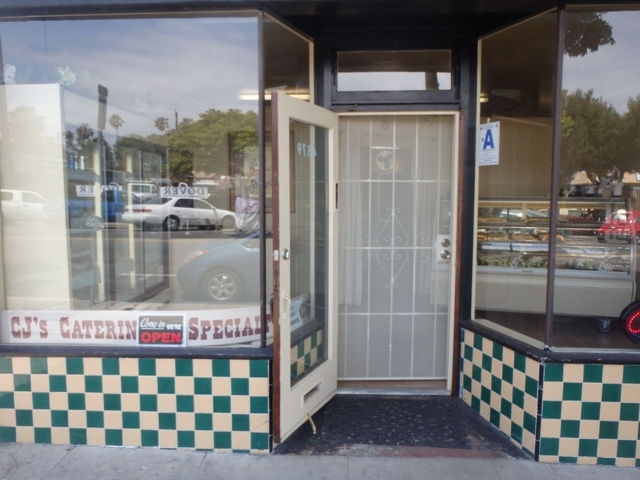 Right there in the middle of the 4800 block, in the former Stephanie’s vegan bakery, CJ has moved his operation – which used to be right on the other side of Catalina on Voltaire (and in Point Loma) – something he has been doing for over 25 years, he told the OB Rag the other day. 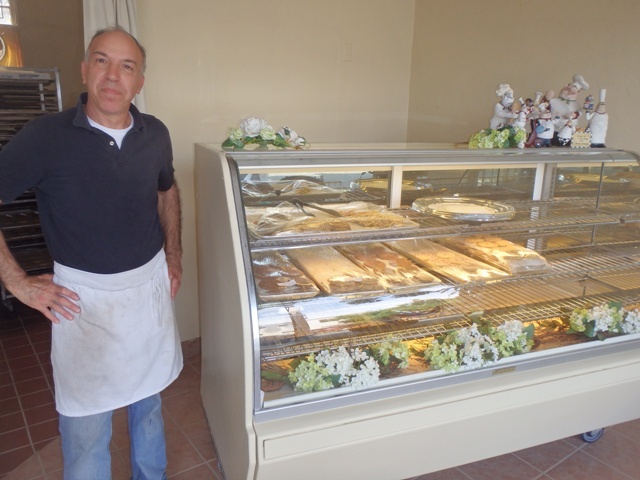 Everything on display is made by his bakery and catering business. 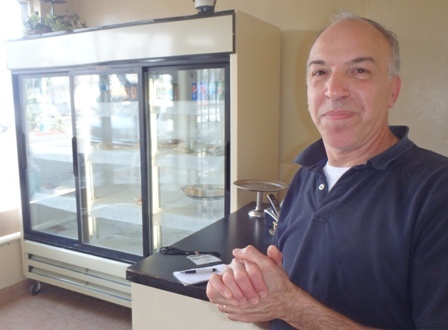 His grand opening was back in March, but everything is good, the mini-pies, the large cookies, the quiche, the breads. CJ is always busy, and he barely had time to tell us about himself, as he goes to at least 3 farmers markets. Originally from Armenia, CJ is very community-minded, having given baked contributions to various neighborhood groups over the years. You know what CJ stands for? Carlos Jose. Brewery Coming in on Corner of Voltaire and Cable? There’s more than rumors that a brewery is coming in at the former unsuccessful dog-wash place on the corner of Voltaire and Cable. Site of future brewery? Corner of Voltaire and Cable. In fact, right next door at the yoga place, they are having signs made that will ask the brewery staff and patrons not to smoke close to their doors. That’s why it’s more than rumors. Signs are being painted, money is being spent in anticipation of the problems coming in with the brewery. With this brewery, and with Pizza Port on Cable and Culture Brewing Company on Newport, and another one being slowly built by Newport Pizza folks – that would make four breweries in Ocean Beach. And that is sweet to know that ol’ OB is becoming a beer-making village. 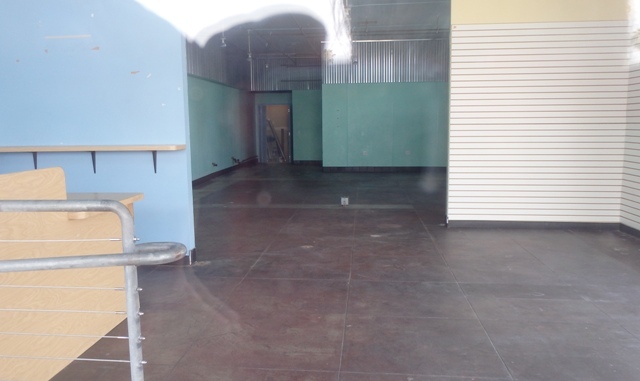 And with the wine-making place also coming to Newport Avenue – what does that mean? It means that we Obeceans should support our local merchants. BTW, Culture is an outlet, not an OB brewery. Guess you’re right there, rick. Unless it’s made on site, it’s not a brewery; I stand corrected – but man Culture is good. I was there last night after the OBTC meeting with a bunch of folks who had attended – including some board members. Culture is becoming the go-to-place-after-meetings for a whole circle of OBceans even though they have pulled the Imperial Stout – damn! I resolve to attend more meetings. Believe it or not, CJ’s Catering in its previous location was still in OB! At least, according to the U.S. Postal Service…. I live just up the street and always feel strange telling anyone I live in OB since to the eye of one who knows the area (a couple of blocks west of PLHS), I live much nearer to Loma Portal than to OB as we know it. 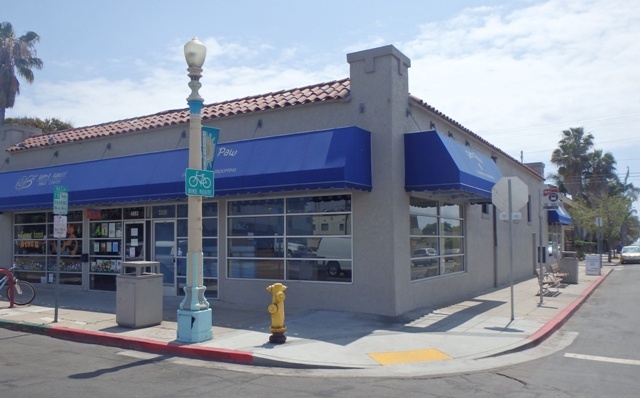 Another odd fact – Point Loma Branch Library is in OB (per USPS!). Actually, we’re all betwixt & between, neither the one or the other. Hey Judy – thanks. There’s the “official” OB boundaries set by the OB Community Plan Area and OB’s east boundary is the middle of Froude Street. Everything east is Point Loma. But the official OB does not include genuine parts of OB, such as the neighborhood around Collier Park. The city never recognized the 92107 area as OB. OB is an attitude, not an address.